Get updated data on Post Li-ion battery patent activity: new patents, patents expired or abandoned, latest patent transfers and patent litigation. How the battery companies tackle the challenges of post Li-ion batteries ? Energy storage market has been booming since the 2000s. Battery market is dominated by Lead-acid and Li-ion batteries. However, the diversifying number of battery applications and niche markets lead to special requirements in terms of capacity, energy density, power density, self-discharge stability, cycling stability, operating temperatures, morphology/weight, safety, and cost constraints. One way to meet market performance expectations is to develop post Li-ion battery technologies. During the last years, new battery technologies emerged (Na-ion, Li-S, Li-Air, Mg-ion) and could be commercialized within the next 20 years. These post Li-ion technologies have to overcome numerous challenges to achieve better performance/cost than Li-ion batteries, leading to significant research attention, and patenting activity at all supply chain levels (electrodes, electrolytes, cells). Major companies such as LG Chem, Samsung, Toyota, and Dyson are already developing their patent portfolio on these emerging technologies confirming post Li-ion battery market potentiality. The entrance of key battery players and the proliferation of emerging technologies have led to a complex technology and competitive landscape that is essential to understand. Patent analysis is very complementary to market research to deeply understand what is going on in post Li-ion battery field, identify cutting-edge technology developments, anticipate changes, early detect business opportunities, and understand competitors’ strategies. The Post Li-ion Batteries patent monitoring service allows you to take advantage of a monthly-updated Excel file and benefit from both quarterly analysis reports and direct interaction with our analysts. The monthly Excel files include new patents, patents expired/abandoned, patent transfers (re-assignment, licensing) and patent litigation/opposition. The patents are categorized by battery technologies (Redox Flow, Na-ion, Li-S, Li-Air, Mg-ion) and supply chain position (Electrode, electrolyte, battery cell, battery pack and systems). This useful Excel patent database allows for multi-criteria searches including priority date, patent assignees, claims, legal status of patents and technology segments. 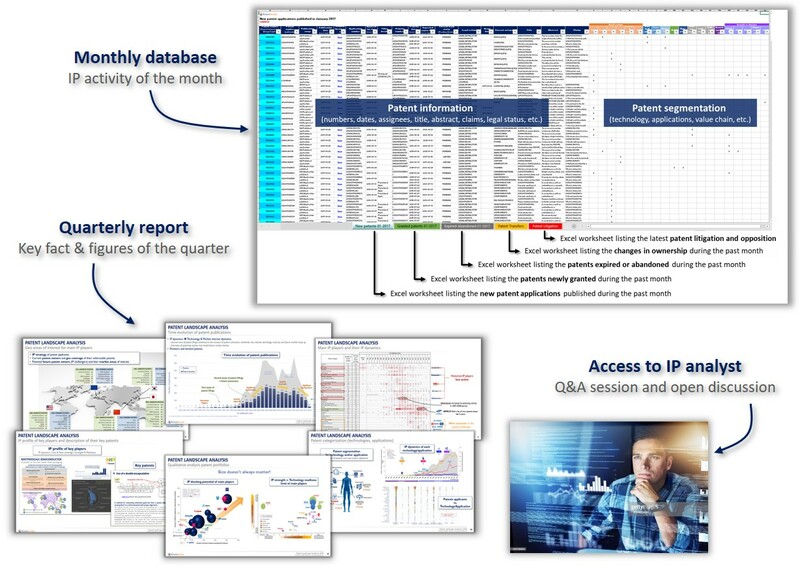 The quarterly reports provide the IP trends over the three last months, with a close look to key IP players and key patented technologies. The direct access to our analysts offers you Q&A session and open discussion on specific patented technologies or company IP portfolios.